In an ideal world, there would be a yoga class that perfectly fits all of our schedules at our favorite yoga studio. But for many of us, that perfect time during the week often comes at ten o’clock at night, five in the morning, or during our quick lunch break. This is why I have become very accustomed to working yoga into my own schedule, in the comfort of my own home. For those of you who are comfortable enough with your practice that you feel you can do yoga at home without any instructions, that’s an amazing and such a wonderful skill set to have. But as someone who is continuously learning, I find that my yoga practice is more effective if I have someone guiding me through the movements (otherwise I might end up asleep in Child’s Pose within the first few minutes). For this reason, I’ve compiled a few of my favorite instructional yoga videos for you to add to your collection (and the best part is—they’re free!) in the hope that they’ll help you grow in your practice, just as they have done for me. This quick routine (just under 25 minutes) is a great way to get moving early in the morning. It’s one of my favorites because it flows smoothly and involves poses like Camel Pose, lunges, and Forward Folds that will get you stretched out. Although it involves plenty of rests in Child’s Pose, it flows quickly enough that you’ll get a jolt of energy that’s better than any cup of coffee. The Yoga Flow Series Workout for Burning Calories is a 10-minute “Class Fit Sugar” led by celebrity yoga instructor Ursula Vari. This is one of my absolute favorites because it’s easy to fit in at any time of day, and is a great way to get your heart rate up if you need a boost of energy. It flows through various Warrior yoga sequences (which are my favorite), and the practice always leaves me feeling strong. After a recent weekend camping trip that involved a high ropes course, I found my back and lower body incredibly sore the following week. I discovered this stretching video by Yogi Nora while looking for ways to relieve my back pain. This video does a great job of getting you stretched out, while leaving you calm, relaxed and feeling good. She also describes various modifications that you can make to your practice to best suit your needs and abilities. running a mile a minute, and sometimes I find myself fidgety with nervous energy about things I need to accomplish the following day. This video is a great way to get you relaxed and ready to hit the sack at night. The video clocks in at 11 minutes long, so it’s easy to slip in right before bed—even if you don’t think you have the energy to hit the mat. Ready to dive even deeper into your practice? 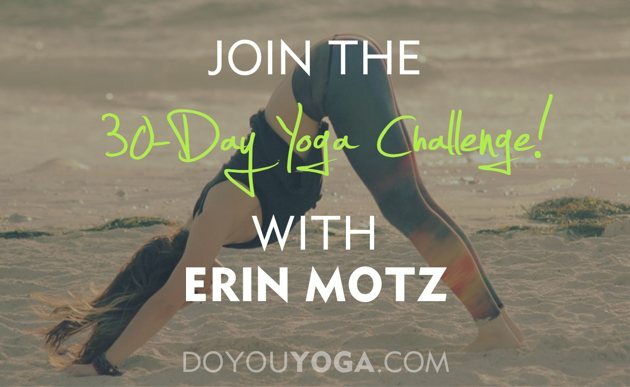 The 30-Day Yoga Challenge With Erin Motz by DoYouYoga!) is a great way to challenge yourself and grow in your practice without having to worry about reaching the studio on time. It’s completely free, and my favorite part is that you never get bored. The videos are easy to fit into your day and classes range from “Full Body Yoga” to “Sun Salutation Yoga Flow” to “Yoga for the Neck and Upper Back.” Joining the challenge is a great way to add a ton of easily accessible yoga sequences to your home practice. It’s also a great way to interact with fellow yogis who have also taken on the challenge. Be sure to check with your physician before engaging in any of these wonderful yoga workouts to be sure that they’re right for you—it’s better to be safe than sorry!